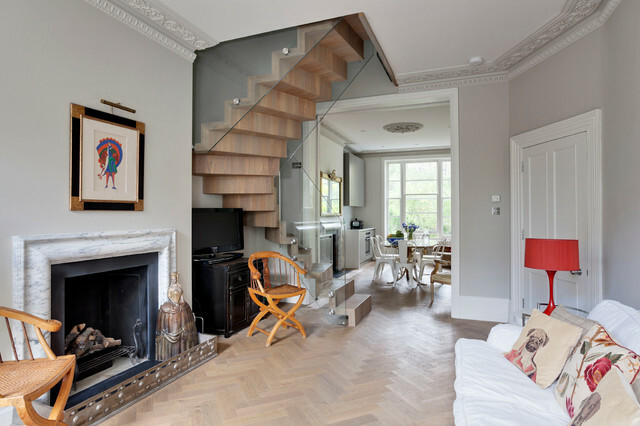 This project involved the remodelling of the ground and first floors and a small rear addition at a Victorian townhouse in Notting Hill. The brief included opening-up the ground floor reception rooms so as to increase the illusion of space and light, and to fully benefit from the view of the landscaped communal garden beyond. Floor - Can you tell me where this floor is from and the name- ref please. Hi, could you please share the paint colour of the walls? Floor looks like Bellstaff style from "walking on wood"
Stairs ? - Could you let me know how the stairs are constructed (steel with wood cladding perhaps ?) and the company that designed and built them ? Hello Alex, did you ever get an answer? Do you know how these were constructed? The large opening between the kitchen-dining area and the lounge might appear original, but again it was created by Fletcher, with architraves added to re-create that crucial period feel. Sliding doors mean the dining and living zones can be separated if needs be. ‘The opening lines up exactly with the window at the back of the house,’ says Fletcher. This allows light to funnel through the room beautifully.An orange lamp adds a dash of retro colour.Spun T2 table lamp by Sebastian Wrong, The Conran Shop. Victoria Harrison added this to Is Open-plan Living Over or is it Here to Stay? Homes need to adapt to changing family needsIt will be fascinating to see how our homes continue to evolve and what an open-plan layout might look like in the future. ‘Buildings have to adapt over time to meet the occupants’ ever-changing needs,’ Andrew Brown says. ‘It’s very difficult to predict how family life will be structured in 20 years’ time. It will be interesting to see how the changing make-up of households, with an increasing number of multi-generational families living together due to house price increases etc, will impact on the current trend for open-plan living.’TELL US…Do you have an open-plan layout? Or are you a fan of more intimate spaces? Please share your thoughts in the Comments below.